All dates and times throughout a course are displayed according to the course time zone. 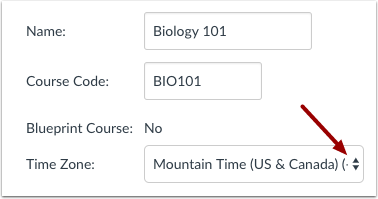 Courses automatically default to the account time zone. However, as an instructor, you may be able to change the time zone for your course. Note: Users can specify a time zone in their User Settings, which does not have any effect on the course time zone. If users have set a specific time zone in their User Settings, all course dates and times will display in their local time, but if they hover over the date and time, they can also see the course date and time. 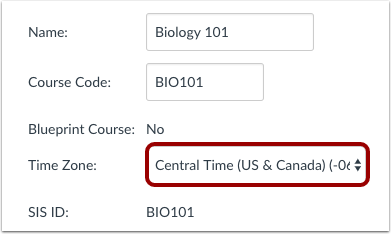 In the Time Zone drop-down menu, select a new time zone for your course. View the time zone for your course. Previous Topic:How do I add an image to a course card in the Dashboard? Next Topic:How do I change the start and end dates for a course? 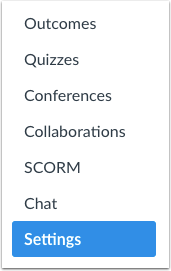 Table of Contents > Settings > How do I set a time zone for a course? Re: LOCAL TIME OR WHAT TIME ZONE? Re: Is there a way to create an assignment with just a due date and no time showing? If I don't set a time, it seems to automatically show 11:59pm.